Settling in after such a long term transitory life is very difficult, and Corinna, like the others, had times that were very difficult. Lori understands how important routines are, and how valuable something like the simple act of going to school can be to help with self-esteem. The children need patience and support to learn that their little lives won't be pulled out from underneath them at any second. Corinna started school, and was a very gifted student who reached Honor Roll. She joined the chorus and found new ways to express herself in a positive way. She made friends who valued her, which is such a gift to a teenage girl. As she started to accept the routines in her life she was given more responsibility for small tasks on the farm. She was in charge of tending to all the plants and flowers, but struggled to trust herself to not to forget...she didn't...and today the flowers and plants are thriving because of the care and attention she gave them. As her confidence grew, so did her desires to help with the animals. A little feral cat was abandoned at the farm, and Corinna took special interest in him spending hours in the quiet of the barn earning his trust. He repaid her by loving her, and she in turn adopted him as her own, and provided his care every single day without prompting. Eventually this sweet girl found her way to the horses, and found her soul's refuge in one of the eldest residents...Misty. At 42 years of age Misty had seen most everything life had to offer, and the years were beginning to take their toll on her. She needed special attention including her diet, grooming, and stabling. 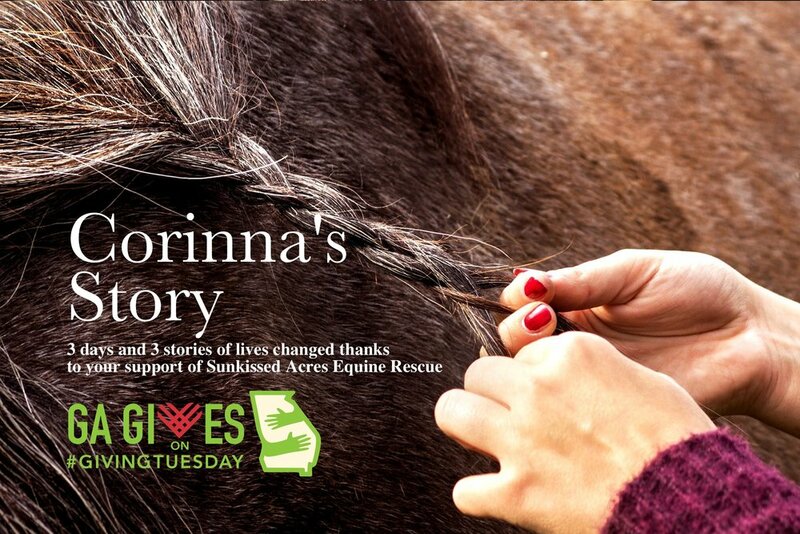 Twice a day Corinna would head to the barn, with her cat following along to fuss over Misty and make sure her every need was met, and more. The act of caring for another, especially one who has nothing to give but unconditional love, is one of the greatest gifts we can give children, and ourselves. To learn the responsibility of tending to creatures who rely on us for their survival is an important lesson. But horses offer us a unique opportunity we will not experience elsewhere, they aren't creatures who seek us out and need our validation to feel loved like our canine companions do. We must earn their respect and trust, learn their language, and understand that we are only guests in their world. In order to be respected and accepted, we must earn it first and earn it honestly and consistently over time. The majority of the horses in the care of Sunkissed Acres are the elderly, those with emotional scars so deep they avoid human interaction at all costs, and those with physical special needs that require constant care. They are horses that need humans to help them, but also horses who have experienced the worst that humans can do. Earning their trust and respect is not something that comes easy, or without a succession of failure. With those failures comes the realization and quintessential life lesson that the respect and trust may never come, but our responsibility to care for them remains. For Corinna, and Carlo, and Danny and all of the children who have come here, the lesson learned is this, to be a person of integrity, and one who gives without expectation of receiving. One who knows that giving can open us up to hurt, but to give anyway because there is always someone or some creature who needs us. To be compassionate to others and respect them for who they are, and not for what they can do for us. On behalf of Lori, the volunteers and the children who call Sunkissed Acres home...thank you. It has been an honor and privilege for me to tell you these stories and give you a glimpse into the private world of the horses and the children. Sunkissed Acres is a very special place, most of you know that already from the stories of the many horses that have been rescued and rehomed, but this is a side so few know and it deserved to be told. I am grateful I had the chance to tell it.